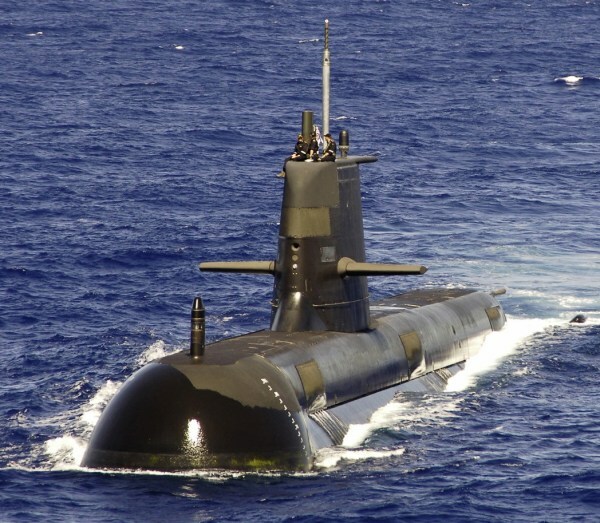 The Australian Defence Department is in the midst of revolutionizing its submarine force with plans to replace its current fleet of six vessels with at least 12 new ones. This is the first submarine project for them in more than 20 years and mandates not only planning to build the new boats but also adjusting personnel to operate them. When complete, the project will enable the nation to protect its interests from both an economic and a security standpoint. Currently dubbed SEA 1000, or simply the future submarine, the program is scheduled to stretch over a long period of time, though no firm dates are set yet. Rear Adm. Rowan Moffitt, RAN, head of the Royal Australian Navy’s Future Submarines Program, says that moving forward there are several key questions that must be answered—How quickly does the government want the 12 submarines? ; What submarine should be built? ; and How much life is left in the country’s current Collins-class submarine force?—because the navy wants to keep them in service as long as possible. Adm. Moffitt explains that the new submarines must be delivered at a rate that the navy can absorb sensibly and likely will run over a period of at least 25 years—longer if more submarines are requested. The vessels will replace the aging Collins gradually. Because of the long timeline, program officials must be mindful that at the point when number 12 is ready, a replacement of the first hull may be necessary. What the government has made clear, Adm. Moffitt says, is that at least 12 new submarines will be obtained; they will run on conventional, not nuclear, power; and they will be assembled in South Australia, most likely in Adelaide where facilities and work force already exist. The admiral stresses the word assembled, because some components likely will be acquired from other places. The question of which submarine will be built raises a spectrum of possibilities ranging from creating a totally new design to buying a vessel off the shelf from another navy. Adm. Moffitt says some Australians are pushing to buy European boats. Though Europeans make good submarines, the vessels might not be the right fit for the island nation. European submarines generally are designed to go short distances. Australia’s distance from other countries, especially its allies the United States and United Kingdom, and its own huge size—coupled with the maritime nature of its region—mandate a boat that can travel a long, long way. Traveling from Perth on the west side of the continent to Sydney on the east is almost 1,800 nautical miles. To travel to the highest-fidelity training available currently, Australia’s submarines cross 8,000 miles of ocean to Hawaii, unaccompanied. The new submarines must be able to carry out their missions even if a forward operating base is denied to them. These factors require them to have great range, which is decided by fuel consumption and storage space, and endurance, which is about food, water and how long people can stay in a submarine without going mad. The admiral says other nations do push their submarines for long distances, but not as a regular part of their concept of operations. “Australia is the only nation on Earth that routinely asks its conventional submarines to cross oceans,” he states. Because of this, Australia requires vessels of significant size. At the time of their introduction, Collins submarines were the largest conventionally powered subsurface ships. Future Submarines Program personnel are in conversations with government to address the various questions. “This is a program which is likely to be the biggest industrial undertaking of an Australian government, a commonwealth government, in the nation’s history, so it needs to be approached in a sensible and measured way, not approached with haste,” Adm. Moffitt says. Australia’s Minister of Defence, Stephen Smith, has been in office for slightly more than a year, and in addition to his work on the new submarine procurement, he also announced a review of the maintenance of Collins-class vessels because of problems in the program. Adm. Moffitt explains that getting a grip on that issue is necessary before moving ahead. HMAS Collins prepares to berth at Fleet Base West. When the Australian Defence Department finishes with its procurement of new submarines, it will have a subsurface fleet larger than its destroyer and frigate force. Adm. Moffitt heads a staff of about 30 people from the navy, the Defence Materiel Organization, the Defence Science and Technology Organisation and the Capability Development Group. No private-industry partners are involved yet, but the office did engage RAND Corporation to perform a study about Australia’s industrial capabilities for the effort. One challenge the navy must address as the project moves forward involves staffing the vessels. Both the number of submarines and the number of crew members necessary per vessel will increase through the SEA 1000 project. Currently, the navy only has approximately 500 submariners, though it has a need for about 650. Immediately prior to his current role, Adm. Moffitt conducted an examination of submarine work force sustainability to provide input to the chief of the navy about how to answer the problems confronting the uniformed force. “I came away from that review with really quite renewed confidence and enthusiasm because I think it’s well within [navy] capabilities to address all the issues causing us pain and grief,” he states. His study concluded that many of the issues are large, complex and interrelated, but all are capable of being under navy control. The government outlined its plans for the future submarine force in its 2009 white paper Defending Australia in the Asia Pacific Century: Force 2030. Defence Department officials have made clear that they foresee a need for a larger, more robust and more muscular navy to handle the security challenges it predicts for the region. Several advantages the new submarines offer are enhanced submarine warfare, better intelligence, surveillance and reconnaissance (ISR) capabilities, antisurface warfare and “possibly land strike in a region of the world which is fundamentally maritime in nature,” Adm. Moffitt says. However, the significant potential for friction must be realized. India and China both are growing their submarine fleets and have tensions between them. Adm. Moffitt says there also could be issues related to South China Sea resources. Australia relies on these sea lanes for its export activities. Davies’ assessment of the white paper, which he says was confirmed through other means, identified China as the principal focus of the efforts and statements. Adm. Moffitt takes a different view. “Many say the white paper focused on China,” he says. “I don’t believe that’s true.” He believes the government’s writings took in an array of likely developments that pose risks as well as the ways it wants to respond to them. Both men recognize that part of the submarine plan as laid out in the white paper is to enable more cooperation with the U.S. Navy. According to Adm. Moffitt, the Royal Australian Navy already is working with U.S. sailors on several submarine projects, and the government is clear about continuing to focus on interoperating with U.S. forces in the Asia Pacific. In fact, Australia does not predict engaging in actions in its region alone. The 12 conventional submarines will be of great significance to both the United States and Australia, Adm. Moffitt says, because given the stated U.S. plans for its subsurface vessels in the area, the Australian fleet would be one-third of the allied submarine force there. The admiral expects that the United States will offer assistance to his country as it moves forward on the submarines, but that because of the new nature of them, Australia also will have to become more self-sufficient. In addition, the time that has lapsed since the Collins build and the program’s troubles require program officials to move carefully. Responding to some critics who say Australia should abandon the Collins and stop pursuing any type of submarine-building program, he says, “That’s not my nation. My nation is more courageous than that.” Rather, as the project progresses, he expects the country to learn from experience and sail on to greater success. In recent years, the Australian media and public have berated the nation’s Collins-class submarine program for its myriad troubles. Reports have stated that only one, or even none, of the six vessels is seaworthy. Earlier this year, Australian Defence Minister Stephen Smith ordered a review of the multibillion-dollar program because of its shortcomings. Andrew Davies of the Australian Strategic Policy Institute explains that, “Maintenance of the Collins fleet has been scandalously bad, and that has affected government confidence and made it harder for SEA 1000 [Australia’s future submarine effort], to get the attention it needs.” But despite negative publicity, Rear Adm. Rowan Moffitt, RAN, head of the Royal Australian Navy’s Future Submarines Program, believes some defense of the Collins is in order. He readily admits the existence of problems related to program management decisions that need to be fixed quickly. Technical issues also exist, but he states a balance needs to be found between those difficulties and the fleet’s successes. Workmanship and trade skills on the boats are good, he explains, and the Australian work force also is succeeding at solving problems inherited from overseas providers. The admiral believes misperceptions are driving some of the criticism. For one, people think that with six submarines in the inventory, six should be at sea. “They’ll never all be at sea, and that was never the plan,” he explains. His frustrations are compounded by the fact that the vessels have performed many actions well and successfully in the past few years, but those are “not things we generally talk about because we can’t,” he says. Another item for consideration is the fact that the sixth submarine was commissioned in 2003, so the entire fleet has been together less than 10 years. “It’s not reasonable to expect immediate success and results,” Adm. Moffitt says, comparing the effort to the U.S. space shuttle program. “The other thing I think is very relevant about the Collins-class submarine is it’s the first military capability in our history for which we were the parent.” Though he says Australians are grateful for help the United States has provided, they cannot turn to enormous research and development resources on the vessels from large, educated, industrialized nations because that knowledge does not exist. To help mitigate the problem, Adm. Moffitt says, he tries to be very conscious of setting the right tone in his discussions with government. He adopts a policy of under-promising and over-delivering. Moving forward, he believes submarine officials must be clear-eyed and hard-headed, understanding plainly why they plan to take certain actions as well as the risks and alternatives.